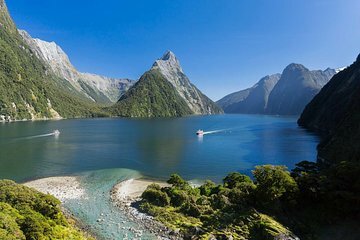 Don’t miss out on the opportunity to take a Milford Sound cruise while visiting UNESCO-listed Fiordland National Park. Departing from Milford Wharf, this boat cruise glides past snow-capped Mitre Peak and waterfalls cascading down steep-walled mountains that rise straight up from the water. See Bowen Falls, Stirling Falls and Seal Point while searching the deep fiord for marine life including bottlenose dolphins and New Zealand fur seals. While you cruise along the southern side of Milford Sound out to the Tasman Sea and return up the northern side, your crew describes the natural features such as Bowen Falls and Stirling Falls that descend from towering slopes into the serene waters of the deep fiord, nestled in World Heritage–listed Fiordland National Park. See points of interest like Seal Point and snap postcard-worthy pics of Mitre Peak, which reaches a height of 5,551 feet (1,692 meters). Enjoy complimentary tea and coffee on board, and dig into a provided lunch (if option selected) before your cruise ends at Milford Wharf. Car Park: On arrival at Milford Sound you can park at the Milford Sound carpark. Please allow 10 minutes to walk from the carpark to the Milford Wharf Visitor Centre. Alternatively a complimentary shuttle service is provided from Discover Milford Sound. Wheelchair accessible onto boat but no disabled toilets onboard. Vessel has large viewing windows, ideal for wheelchairs.